Jock Safari Lodge has breathtaking topography and is nestled where the Mitomeni and Biyamiti rivers flow as one, situated in the south-western corner of the Kruger National Park. There is no alien vegetation in the rivers. The rivers flow only if there is enough rainfall. The lodge offers 6,000 hectares of exclusive traversing rights in an area of the park which is celebrated for Big Five game viewing. Jock of the Bushveld, the legend that was, served as inspiration for the aptly named Jock Safari Lodge. The tale, inked by Sir Percy Fitzpatrick, tells of canine devotion and has since moved many exploring hearts. The Southern boundry is the old Voortrekker road, which was the transport route for supplies from the Delego bay which is now Maputo, up to the gold fields at Pilgrims Rust areas. The Jock concession is the exact side profile of Jock the dog. In 1982 the Niven Family who own Jock Safari Lodge built a fence around the camp and that helped in preserving all the trees from destruction by visiting elephants. The conservation-conscious Niven family also planted indigenous trees within the fenced area & they have grown to create an ambience under a canopy of shade different to the exposed wilderness just outside of the lodge. Carefully screened by lush trees and reed walls, the 12 individual en-suite thatched rooms at Jock Safari Lodge, impart a sense of aloneness and oneness with the landscape. Each chalet has an outdoor shower, air-conditioning, private mini bar, tea & coffee making facilities, a private plunge pool and Sala overlooking the river. 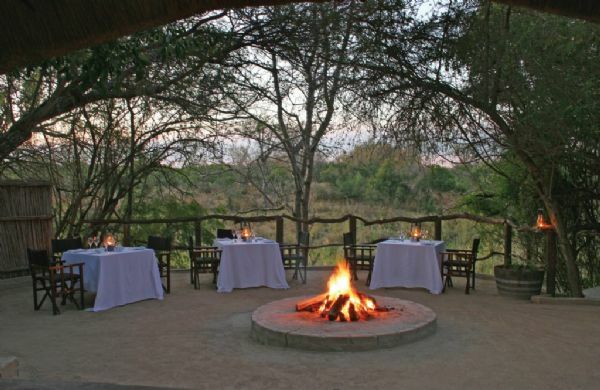 Interactive game drives, lasting up to 3 hours, take place in the tranquil moods of sunrise and sunset. You are guided by your game ranger in an open game viewing vehicle and you are asked to share any particular interests with your ranger who will try to incorporate these into your game drive. On game drive guests will enjoy a sundowner drink at sunset and coffee/tea at sunrise. No persons under the age of 6 years are permitted to join game drives. Children from 4 years up to and including 6 years of age will enjoy game drives in a closed vehicle. Qualified walking guides provide the opportunity for guests to experience the excitement of approaching species on foot. No persons under the age of 12 years are permitted to join the game walks. Kindly ensure to request this activity at the time of booking accommodation as nature walks are subject to the availability of qualified guides. Various treatments can be enjoyed at the Relaxation Retreat which are situated at the main lodge (Main Jock). Treatments should be booked prior to arrival with reservations. An exciting and adventurous alternative to staying at either Jock Safari Lodge or Fitzpatrick’s is to stay at the Jock Explorer Camp. Click here for more information.